Detail – 1 LED recessed ceiling fixtures, under cabinet lights and interior cabinet lighting makeup this kitchens lighting plan. All systems are controlled by their own dimmer. Detail – 2 Removal of walls to create an open floor plan space requires focused selection of light fixtures design and lamp source. Exposed lamps (bulbs) must not interfere with vision of persons seated in adjacent spaces. Detail – 3 LED light strips illuminate the closet interiors so you can distinguish between Navy Blue and Black. Detail – 4 Remember light sources will reflect in highly polished floors. Detail – 5 LED tape is fitted on cabinet frames to project light into this dish cabinet with three sides of glass. Detail – 6 Sand-blasted glass inserts in sliding doors allow light to filter out when doors are closed. The automatic switch built into the frame has a separate control. 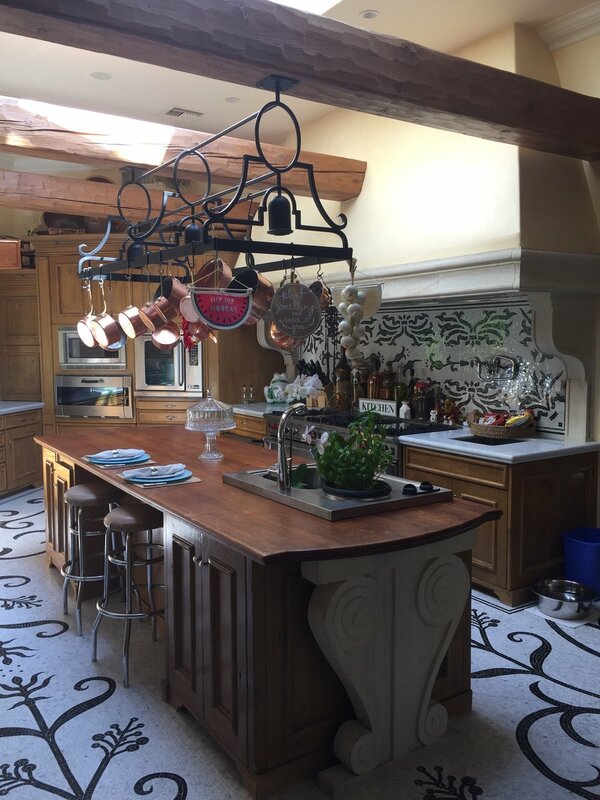 Detail – 7 Custom designed pot rack with down lights by Mary Fisher Knott. Detail – 8 Glass shelf allows under cabinet lighting to shine through.